Hi All! Melissa here with an update on some of the progress that’s been happening at our beloved Mt. 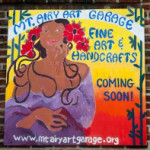 Airy Art Garage (MAAG). Two Thursdays ago, thanks to the abundant generosity of our supporters, MAAG received three truckloads of donations! That’s right, count ‘em: Three! With ample hands and hearts devoted to the task, the move went extremely well and we’re proud to report that no movers were hurt in the process (only one torn pair of pants and a bruised ego from an embarrassing stumble). As we traveled, collecting goods from the top of the Hill to the heart of Mt. Airy, a cooperative atmosphere could be felt. After all, community is what forms the very foundation of MAAG. Special thanks go out to Maureen Pitcher, MAAG Member and owner of Art on the Avenue Framing, who donated a mat-cutting table and Pam Learned, former owner of Hill on the Avenue, who gifted us software and an entire garage of office furniture. 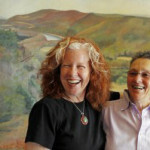 Without the charitable contributions of these two women, and individuals like them, MAAG would not be what it is today. Even Mother Nature, herself, couldn’t resist the communal creativity of the Northwest, as she provided a cool breeze and reasonable temperatures that peaked no higher than 80 degrees. To say the least, we were grateful for such a lovely day. After the filing cabinets, drafting tables, and shelving units made their way into the Garage, I stood in the doorway and envisioned what the space would soon be. With my eyes closed, I could hear the chatter of voices in the room, the sound of lead on paper, laughter billowing out of the spaces. Folks, this move only puts us one step closer to establishing a cooperative center for the Arts, right here, in the Northwest, where it belongs. It puts us one step closer to a place where we can all gather to learn and dream and collaborate. For now, we’re excited and focused on starting Phase I of our construction. Still, we need your gracious and continued support! Please remember, without YOU, there is no US! And, on a less serious note, enjoy this cartoon rendering of the move. 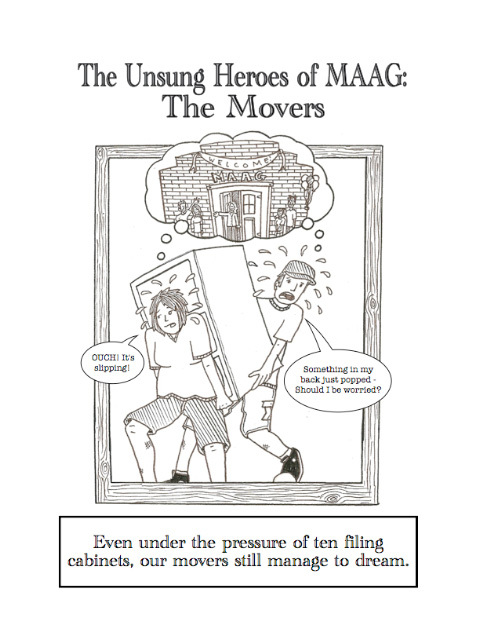 It’s the first in a series of cartoons that will highlight all those behind-the-scene supporters at MAAG. Coming of Age With WHYY…Who Knew It Could Be So Sweet? Ready, Set, Build!